If your organization is interested in hosting a local event or promotional activity, visit Learn About NDAFW. If your organization is interested in partnering with NIDA for NDAFW, review the information below for ideas. Let others know about NDAFW. Post on Facebook or Twitter; add photos to your Flickr, Pinterest, and Instagram pages; shoot a video; and blog about your event or promotional activity. Need ideas for posts? We’ve provided sample Facebook status updates that you can easily copy and paste to help show your support for National Drug and Alcohol Facts Week®! Be sure to like the NIDA Facebook page and tag us in your posts! [Tag friends, colleagues, partners] You've been tagged! Spread the word about National Drug and Alcohol Facts Week® and tag 5 other friends to help spread the word→ http://bit.ly/9rUsL8. National Drug and Alcohol Facts Week® is coming. 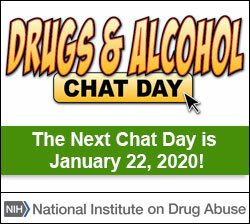 Go to https://teens.drugabuse.gov/national-drug-alcohol-facts-week to find events near you! To help spread the word about NDAFW and SHATTER THE MYTHS® about drugs, be sure to use the hashtag #NDAFW. Need ideas for tweets? We’ve provided sample tweets that you can easily copy and paste to help let folks know about NDAFW. Be sure to follow @NIDAnews and @NIAAAnews and mention us in your tweets! Go to https://teens.drugabuse.gov/national-drug-alcohol-facts-week to see who is hosting an #NDAFW event. NIDA would love to see your NDAFW images! Include this Release Form [PDF, 82KB] with any photographs, audio files or videos that you share with NIDA. Customize your Flickr, Pinterest, Instagram, or other visually interesting page using NIDA images. We have numerous videos on our YouTube account that you can share on your social media accounts. Have a blog? NDAFW makes a great post. The National Institute on Drug Abuse and the National Institute on Alcohol Abuse and Alcoholism is holding its annual National Drug and Alcohol Facts Week®. Taking part in National Drug and Alcohol Facts Week® gives us a chance to help teens SHATTER THE MYTHS® about drug and alcohol use. Teens are bombarded with conflicting messages that can leave them feeling confused and unsure of who to ask for information about drug use. Host a local event in your community—Check out our Plan Your Event page for all the details. Order free materials and pass them out to teens. Take the National Drugs & Alcohol IQ Challenge, which is updated each year. Give a shout out on social media—#NDAFW. To see the full array of NIDA materials, visit our Order Free Materials page. To use one of the following logos, copy and paste the code in the text box next to the badge into your source code. Placement of the drugfactsweek.gov logos are to be used only as a marker to the drugfactsweek.gov site and a channel for drugfactsweek.gov content. The use of a widget or link does not indicate any form of endorsement or approval from NDAFW, the Coordinating Center for Health Information and Service, or the U.S. Department of Health and Human Services. To use one of the following web badges, copy and paste the code in the text box next to the badge into your source code. SHATTER THE MYTHS & Design ℠ is a mark of the US Department of Health and Human Services. The Bay Area Council on Drugs and Alcohol hosted more than 350 students in Texas City, TX on January 23, 2019 for a signature NDAFW® event. Community partners ranging from the University of Texas Medical Branch to the Prevention Resource Center and The Council on Recovery staffed 15 labs offering students a hands-on, interactive experience designed to increase student knowledge on substance misuse prevention and education and improve decision-making skills. The National Organization on Youth Safety (NOYS) provided planning and on-the-ground support for this innovative collaboration, which showcased the potential of community activation for shattering the myths of drug and alcohol use. Help promote NDAFW by adding our logo, widget, or one of our badges to your site and we will add your site to this page. Each year during the last week of October, hundreds of schools across the U.S. take part in Red Ribbon Week. National Red Ribbon Week is a unified effort, sponsored by the National Family Partnership, to promote student commitment to a drug-free America. It began in 1985 after a grim event in our Nation’s history when Drug Enforcement Administration Agent Enrique Camarena was murdered. He had joined the DEA based on his philosophy “I’m only one person. But I want to make a difference.” Red Ribbon week educates students about how communities can come together and make a difference in the fight against illicit drug distribution and use. The event is often marked with school spirit, can-do attitude and enthusiasm. The DEA is part of the U.S. Department of Justice. For more information on Red Ribbon Week, click www.getsmartaboutdrugs.com. The GRAMMY Foundation® and MusiCares® Teens! Make Music Contest offers a great opportunity for aspiring teen musicians to use the healing and uplifting medium of music to help spread the message about the importance of healthy choices and the dangers of drug abuse. The contest asks young musicians to create original music or music videos that celebrate healthy and inspirational living, or accurately depict the dark side of drug abuse. Check out the songs from previous winners.